The Best Coffee Gifts Are At T..
Howard Schultz Steps Down As C.. Welcome to the latest episode (episode 30!) of the Coffee Sprudgecast. In this episode, co-founders Jordan Michelman and Zachary Carlsen talk about the 2016 Sprudgie Awards nomination process. Vote for your coffee heroes now! Decent Espresso beta machine at the Sprudge HQ. Elsewhere on the show, Zachary Carlsen sits down with John Buckman, CEO of Decent Espresso and talks about their brand-new home espresso machine. The Decent Espresso machine, now shipping its beta models, comes equipped with advanced tech that promises to give the user unparalleled control of pre-infusion time, temperature, pressure, and flow-rate. The design is striking in its simplicity and the sturdy ceramic drip tray and water tank give it a nice heft. One notices that there are no analog buttons on this machine as it’s all controlled digitally through a tablet. Buckman and his team spent years developing the Decent Espresso machine and a number of components and barista tools in their Seattle lab. It’s a thoughtful piece of gear and one we’ll be keeping an eye on as they roll-out their first-gen models early next year. 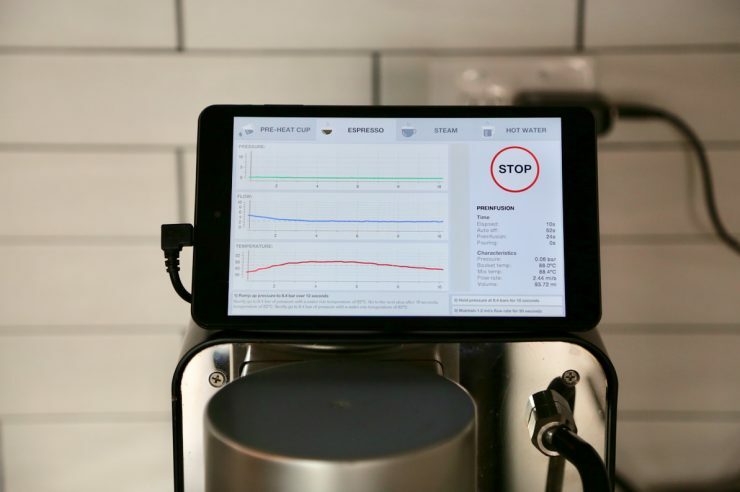 The digital interface on the Decent Espresso unit graphs out temperature, flow rate, and pressure on the on-board tablet. All this and much more on this week’s episode of the Sprudgecast, fueled by a splash or three of the Finca El Injerto Grand Cru Cold Brew from Stumptown Coffee and producer Arturo Aguirre.